Crayola Crayons are famous for their rich, vibrant color. That's why Crayola is the name kids recognize in crayons. 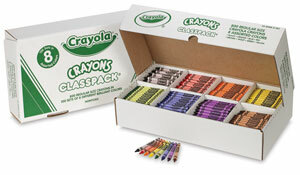 This Classpack contains 100 sets of eight colors in a sturdy box with individual compartments for each color. Colors include Black, Blue, Brown, Green, Orange, Red, Violet, and Yellow.